January 29, 2035. That’s the day the comet is scheduled to hit—the big one. Denise and her mother and sister, Iris, have been assigned to a temporary shelter near their hometown of Amsterdam to wait out the blast, but Iris is nowhere to be found, and at the rate Denise’s drug-addicted mother is going, they’ll never reach the shelter in time. Then a last-minute encounter leads them to something better than a temporary shelter: a generation ship that’s scheduled to leave Earth behind and colonize new worlds after the comet hits. But each passenger must have a practical skill to contribute. Denise is autistic and fears that she’ll never be allowed to stay. Can she obtain a spot before the ship takes flight? What about her mother and sister? When the future of the human race is at stake, whose lives matter most? 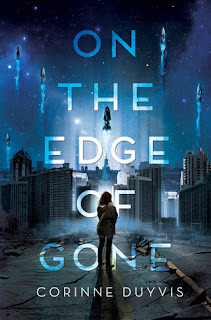 On the Edge of Gone is a fast-paced book with one of the most three-dimensional characters I've ever read. It's set in the near future, immediately before and after a comet hits Earth. I really do love a good post-apocalyptic read, and this one didn't disappoint. Denise's autism gave her a whole different set of struggles than many of the other survivors. She's a great example of a character who isn't always the most likable, who makes choices that aren't the most noble, but one you root for the entire book. The secondary characters -- Denise's mother, sister, and friends both aboard the ship and out in the destroyed city -- are also flawed and realistic. The book is long, but the plot never drags. A thoroughly enjoyable read that I highly recommend! Read more about On the Edge of Gone on Goodreads.